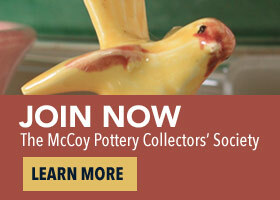 Welcome to the Official McCoy Pottery Collectors’ Society Website! Journals are published four times a year so place your ad today! See the extensive information our Society members have with the Quarterly Journal. Are you a collector of McCoy Pottery? If you are, you have come to the right place. We are the McCoy Pottery Collectors’ Society and we are made up of McCoy Collectors all across the US and Canada. Since the late 1980’s, as many collectors as are able, have annually gathered in Zanesville, Ohio, (the Pottery Capitol of the World) every July. Pottery Week, as it is affectionately called, is a week that is set aside in the Zanesville area for all pottery lovers of the many potteries that produced in this area to come together and show, swap, and sell the pottery they love. In addition to our annual gathering, we also publish a Journal on a quarterly basis. The Journal is not only filled with current activity information on the Society, etc., but it contains many articles from members of the Society, sharing their knowledge, recent finds, and experiences in general. The Journals will become a true reference set for you of information, in addition to any McCoy Pottery reference books or other material you may already have. We have a Society sponsored McCoy Pottery auction, as well as a banquet and other activities. If you love collecting pottery, you will be in pottery heaven. It is quite an event and we invite you to join us next July. Our Society is made up of collectors of all ages from new to experienced, and all have a simple desire to share the experience of collecting McCoy Pottery with other collectors. In all ways, our Society is dedicated to enhancing your collecting enjoyment. We invite you to check out our web site. Among the many areas to visit includes the story of how our group was originally formed in the 80’s, The Purpose of our Society, our Code of Ethics, the history of the McCoy Potteries, past Journal articles, information on fakes and reproductions, and details on next year’s Pottery Week, as well as some photos from this year’s convention. You will also find contact information for the Society and all of the Officers. Please do not hesitate to send us your questions – we look forward to hearing from you.